William Faulkner’s Underwood Universal Portable typewriter, rests on a tiny desk his stepson helped him build. It's the highlight of the Rowan Oak experience for many visitors, even though this room was part of the open back porch until Faulkner spent part of a Random House advance to enclose it in l952, long after he had written his seminal Compson and Sartoris family novels. He insisted that this room not be called his "study." According to biographer Joseph Blotner, "he did not study in it, so there was no sense in calling it that. It was the 'office,' the traditional name for the room in the plantation houses where the business was transacted." As to the typewriter itself, Underwood introduced its Universal Portable in the mid-l930's among a full line of portables such as Champion, Noiseless Portable and Junior. Faulkner had a habit of buying used portables locally, wearing them out, then trading them in on more used portables. This Underwood was one of at least three typewriters in Faulkner`s possession at the time of his death (the University of Virginia has one, too). So, this is no more "the" typewriter any more than those square carpenter`s pencils next to it are "the" pencils. Had Faulkner lived a few more years, this machine would have met the same fate as the rest. Still, the room has a resonance. BOOK magazine was publishing an article of mine on "Yoknapatourism," [see the text of it below] and thinking (mistakenly) that the editors hadn`t already selected a photographer, I returned to Oxford on a rainy October afternoon to make my own pictures for submission. The travel piece was eventually illustrated with sunny-day brochure shots, but I was happy to keep this one for myself. There was no direct lighting within the office, so I let the film take its time, soaking up faint incandescent glow from the library and main hallway, which neatly balanced the cloudy daylight. 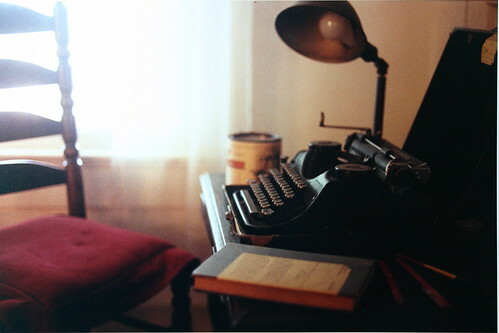 I used the camera`s timer so my hand wouldn't jostle the tripod, and I even backed out of the room--in part to let the scarce light do its work and, I think, because I wanted Faulkner`s office truly vacant.